3 steel rings of 3/8" rod. Ring size: 13.50 to 14.25 inches. 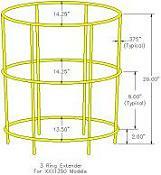 Will add 18 inches to Tomato Cage / Vegetable Support 4 Ring Model 6041350. Finished with a Powder Coating Paint for a great protective finish. Select from the above colors of Green, Yellow, Orange and Red.